The program is expected to be launched this Fall. We’re still waiting for some details on how the incentive is paid back, and how increases or decreases in equity will be handled. Stay tuned! 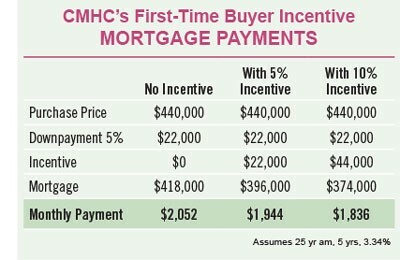 The Home Buyers’ Plan (HBP) allows first-time buyers to withdraw up to $25,000 ($50,000 per couple) from their RRSP to help with downpayment and closing costs, without having to pay tax on the withdrawal. HBP withdrawals are not added to a person’s income when withdrawn, but instead must be repaid over a 15-year period. The budget proposes to increase the maximum withdrawal amount to $35,000 per qualified buyer, which is effective immediately.